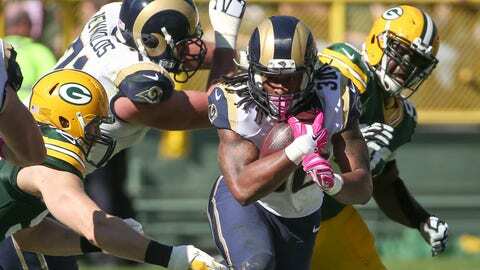 Rookie Todd Gurley has rushed for 305 yards over the past two games. The St. Louis Rams kept tight wraps on running back Todd Gurley while patiently waiting for the prized rookie to fully recover from a torn ligament sustained last season at Georgia. Consider those chains removed. Gurley's latest explosive performance, a 159-yard, 30-carry effort in Sunday's 24-10 loss at the Green Bay Packers, provided ample evidence that the Rams plan to ride him early and often when they return from next week's bye. Held out of the lineup during the preseason for the first two games, Gurley made a quiet NFL debut with nine carries on six yards in Week 3. He had only two yards at halftime in a Week 4 victory at Arizona before erupting for 144 yards in the second half – a precursor to Sunday's standout performance. Gurley was a one-man show against the Packers, keeping the Rams within striking distance despite a total absence of a passing game. Quarterback Nick Foles was intercepted four times and threw for only 141 yards – with nearly half of that coming on one throw in the game's final minute. In his past two games, Gurley has amassed 305 yards on 49 carries – league highs in both categories – while averaging 6.2 yards per rushing attempt. He also has ripped off five runs of at least 20 yards in that span, including two of more than 50 yards. “Once he hits that hole, he’s hitting it,” Foles said. “That is going to open up a lot of things.